Keep your data center front and center. 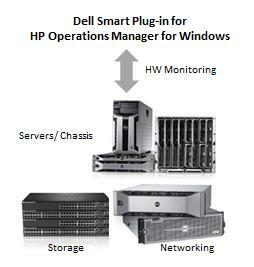 Free download: Dell Smart Plug-in for HP Operations Manager for Windows. Your servers, chassis, storage and switches are the backbone of your IT infrastructure, but keeping watch over every data center system can be overwhelming. Many organizations only address problems after they arise, causing significant business risks. Dell Smart Plug-in for HP Operations Manager for Windows provides a proactive approach to data center management that delivers features for monitoring Dell server, storage, and networking infrastructures in environment managed by HP Operations Manager that’s easy and cost-effective. It protects customer’s existing investment in third party consoles and helps in ease of integration and monitoring of Dell devices within third party consoles. This download can give you a comprehensive view to the health of your data center, and enable you to take corrective action faster or even before issues arise. Complete the form to download your free Dell Smart Plug-in for HP Operations Manager for Windows. All fields required, unless otherwise denoted. Would you like to be contacted by a Dell systems management expert to discuss data center solutions? For information on how we protect your personal data, see our Privacy Statement. You can unsubscribe at any time. * In an effort to reduce the time taken to fill out our forms, we are using functionality from our partner Demandbase that allows you to choose your company from a list of likely alternatives based on your IP address or domain.